Your dog is the mirror, reflecting your love, care and even your attitude toward the world around you. If you want your pet to look good, you need not only to feed him well and to groom him, but also to put on him reliable dog gear of the highest quality possible, for it affects not only impression of other people, but what is the most important, your doggy’s health and mood. 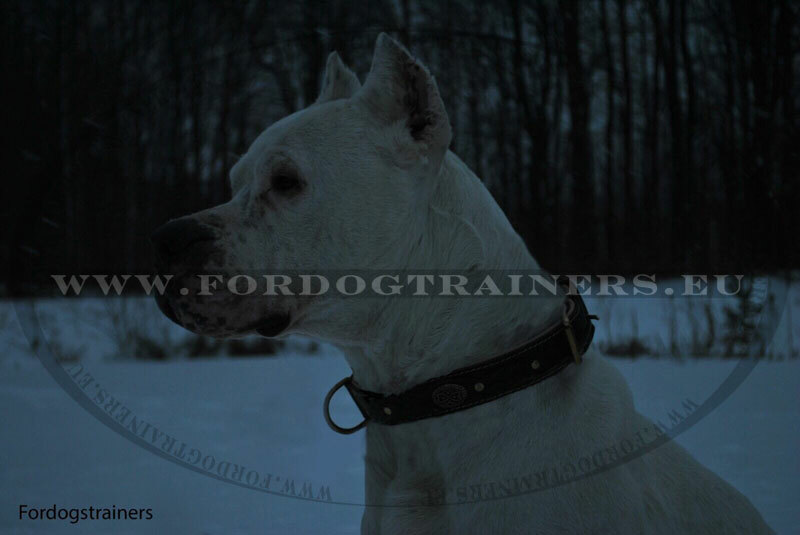 We present you the dog collar, made of the best selected leather, which possesses a set of advantages, making it extremely convenient for walking and training your dog. 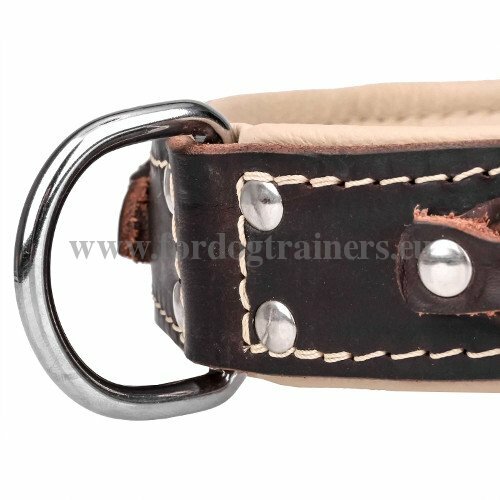 This dog product is handmade and handstitched, its width (40 cm) makes it perfect for medium and large dogs. We do not make any doubled-up fillers and machine stitches, thus preventing the edges from fraying. If you pay attention to the design of this leather collar for dog, you’ll see it is exclusive because of original braids, chromed rivets and chromed fittings on it. Contrasting stitching makes it even more beautiful. 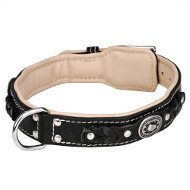 All the decorations are riveted not just to beautify the collar, but also to make it reliable and long-serving. Besides, there is an extra soft nappa padding, creating additional comfort and adding to the collar’s style. 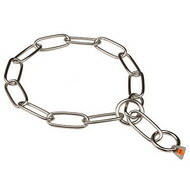 Thanks to a fur-protective plate you will not worry about your doggy’s coat. 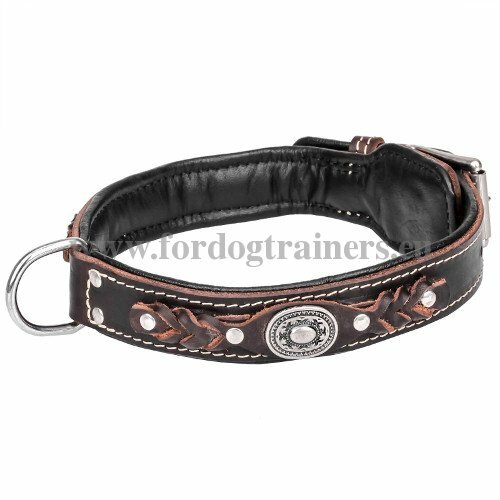 So, whether you’ll appreciate all the advantages of this unique padded collar for medium and large dogs, depends on your choice right now! Find out how to measure your dog correctly, order the collar and then enjoy your mirror reflecting happiness and satisfaction! 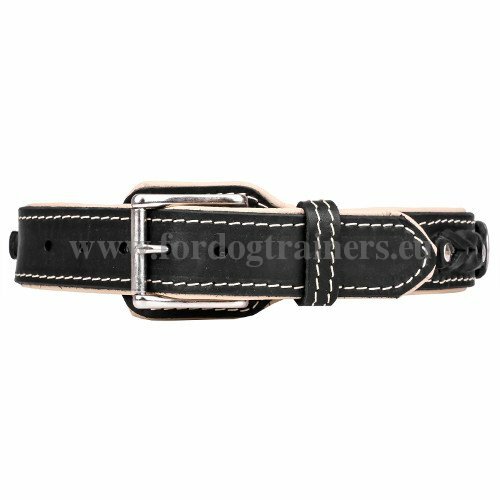 See other Luxurious Leather Dog Collars, Handcrafted Leather Dog Leads, Excellent Training and Walking Harnesses and other outstanding products for your dog in our on-line pet store! Hello guys, thanks for my beautiful collar!